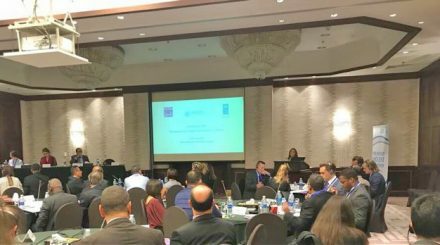 Two UN organisations – UNDP and UNODC – joined with PRI to hold a joint consultation with international experts and practitioners in Amman this month. The aim was to take stock of current knowledge and exchange information on good practice in addressing the issue of violent extremism in prison. Regional and global experts from over 13 countries gathered to develop a better understanding of the process of radicalisation to violence in prisons and detention centres currently dealing with this challenge. In her welcome speech to the workshop, PRI’s Executive Director, Alison Hannah, commented on the rapidly expanding body of research and insight into the challenges and solutions this topic presents for prison services. All participants agreed that security measures alone cannot be the answer as a punitive approach serves only to reinforce and exacerbate extremist views and a perception of discrimination encourages the spread of radicalisation inside prisons. Taghreed Jaber, who co-organised the workshop and who is PRI’s Regional Director in the Middle East and North Africa (MENA), summarised the current scale of the problem. PRI has been the leading NGO promoting understanding of this issue, having held its first international roundtable on the topic in November 2015. Participants from the MENA region – and elsewhere – gave practical examples of steps taken inside prisons to manage this particularly challenging group of prisoners and minimise the risk of disturbance and extremism, while adopting a humane approach based on the international standards that apply to all people in detention. These are comprehensively set out in the excellent UNODC Handbook on Management of Violent Extremist Prisoners and the Prevention of Radicalisation to Violence in Prisons, building on the principles set out in the Nelson Mandela Rules for the treatment of prisoners. The UNDP has recently completed a large research project in Africa, adding to the understanding of the radicalisation process, in which interviews were held with almost 500 prisoners and other individuals in custody, to deepen the understanding of the drivers towards radicalisation. It continues to expand the evidence base, enabling the establishment of policies to prevent violent extremism, and demonstrates this commitment through its country offices, many of whom shared information on current interventions in this field. Read an expert blog by Dr Shane Bryans, a former UK prison governor and criminal justice expert, who examines how prison administrations can manage violent extremists in their care. A podcast version of the blog is available here.